News breaks first on Twitter. Hot news gets lots of tweets and re-tweets. 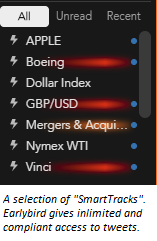 Market EarlyBird has introduced Volume Alerts to show when the quality-weighted volume of tweets is higher than normal. These appear alongside your selected folders and draw your attention to what's moving in the Markets that you're tracking. Simple and very effective. 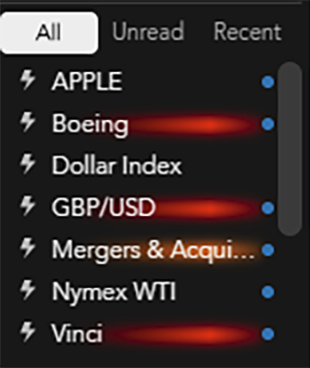 How do the Volume Alerts work? We continuously monitor the volume and quality of Tweets coming into each SmartTrack. We also monitor how Tweet rates vary during each hour of the day, so as the day goes on and we see a higher than normal volume/quality for that time of day, we start to show the colour bars. Red for hot, fading to yellow. Black indicates a normal volume of Tweets. Last weekend we were interested to see why tweets about Boeing were particularly busy. 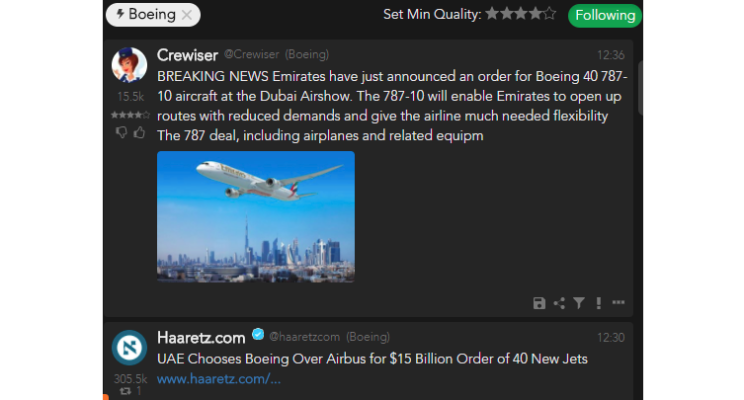 The Tweet at the top of the post shows why: Emirates unexpectedly agreed to place an order for the Boeing 787 rather than Airbus at the Dubai Airshow.